Birdman (or The Unexpected Virtue of Ignorance) is an audacious film. It was designed to make it seem like the entire movie was shot in one take, when in fact it is a series of long, uninterrupted scenes seamlessly spliced together. Shot by Emmanuel Lubezki, who won an Academy Award for Best Cinematography in last year’s groundbreaking film Gravity, Birdman is one of the year’s best films not merely for its wildly imaginative form, but also for its deeply satiric and personal narrative. The opening shot of the film is telling. Our hero, Riggan Thomson, is meditating in midair, wearing nothing but his underwear. Played by Michael Keaton, Riggan is a former box-office superstar who earned worldwide adulation playing a popular superhero in the hit franchise Birdman. After completing a trilogy of Birdman films, Riggan hung up the cape and cowl and fell off the map into oblivion. A man caught in a sort of midlife crisis, insecurity creeps in as he wonders about his place in history. Hoping to reassume the mantle and gain back the adulation of the public, Riggan has invested his own money to write, direct, and act in a Broadway adaptation of Raymond Carver’s What We Talk About When We Talk About Love. He wants to prove that he is a seriously legitimate actor. By shedding everything but his underwear, Riggan is attempting to recreate a new persona. Instead, Birdman’s past is still hovering over him. The film begins with the play still in preview. It is a colossal mess that worsens when one of the central actors gets into a strange accident. As Riggan consults with his long-suffering friend and manager, Jake (Zach Galifianakis), they manage to rein in Mike Shiner, a self-serious method actor and the apotheosis of the theater world. Mike is also dating a fellow costar and one of Riggan’s close friends, Lesley (Naomi Watts). Wonderfully played by Edward Norton, Mike was brought in to add credibility. Standing as the antithesis of Riggan, Mike is like a bomb ticking underneath a table. His unpredictable nature brings to mind some of today’s actors, who also carry similar baggage. If Norton had not done it, I could easily see someone like Shia LaBeouf or Christian Bale filling into his shoes. Watching Riggan and Mike engage in verbal boxing matches, where they can manage to combine Justin Bieber and Roland Barthes into a single conversation, is an extremely satisfying experience as the latter questions the former’s motivation to do this play. As if dealing with a self-serving actor wasn’t enough, Riggan is also juggling with his personal life and existential crisis. Sam (Emma Stone), Riggan’s druggie assistant/daughter, is the sort who is always giving her father lip because he wasn’t always there for her. Riggan is caught in a relationship with Laura (Andrea Riseborough), a costar who is possibly pregnant. However, Riggan’s biggest hurdle is that of Tabitha, a critic whose reviews have the capacity to shut down any play. Riggan’s scene with Tabitha is one of the best examinations on the notions of criticism since Anton Ego’s review in Pixar’s Ratatouille. As problems grow exponentially, Riggan slowly unravels, descending back into his alter ego, Birdman. Through voiceover, Birdman represents the doubt, anxiety, and insecurity that plagues Riggan’s mind. Birdman tempts Riggan to don the cowl and cape again, to fall back into a life of security and adulation. I won’t spoil it for you but Riggan ultimately boils over in a climax that is sadly ironic. On a quick side note, it has been said that Riggan Thomson’s career is an identical projection of Michael Keaton’s career. However, it is unfair and irresponsible to read the film through this lens. Though similarities can be drawn from Batman/Keaton and Birdman/Thomson, Keaton isn’t playing himself as much as he is playing an archetype of actors who have the same professional trajectory. Credit must be given to director Alejandro Gonzalez Iñarritu’s for casting Keaton. Iñarritu uses Keaton’s past as a stepping-stone, not as an epitome of the downward spiraling actor. This is Alejandro Gonzalez Iñarritu’s fifth feature film and it is his best film to date. Iñarritu first made a name for himself with Amores Perros. He followed it with 21 Grams, Babel, and Biutiful. Known for weaving together interlocking stories and characters, Iñarritu’s films are, almost to a fault, solemn, downtrodden, unsmiling, and self-serious. These are not the type of films that can pull you out of your own personal hell. On the surface, Birdman is a significant departure for the director. It is funny, witty, satirical, and lively. Yet, the bubbling lava that resides in all of the characters is signature Iñarritu. While the film is not structurally similar to his previous films, the idea of the continuous long take serves the same purpose. Iñarritu’s films leave very little moment for you to breathe. The sheer force of life hits us like a wrecking ball and it is up to us to adapt and cope. Sometimes we fail to do so and get swept up by the tides. Birdman concludes with an ambiguous but hopeful ending. 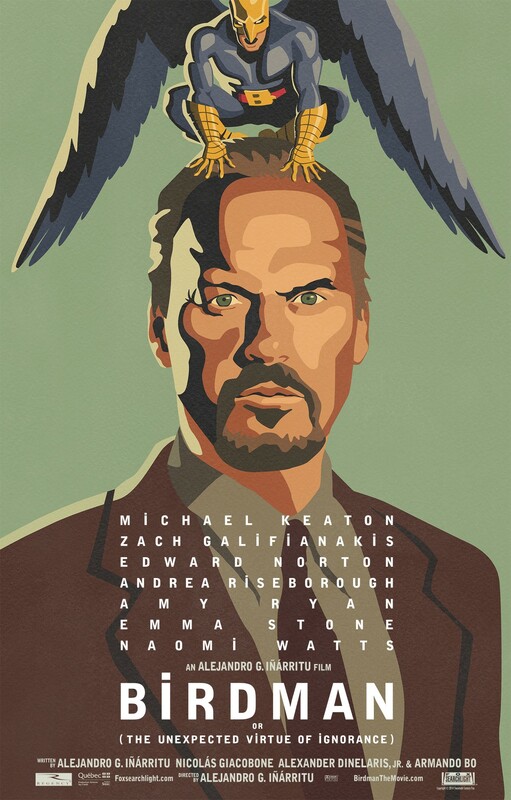 Although it is less funereal and grave than his other films, Birdman is Iñarritu’s most mature film to date. This is his masterpiece.